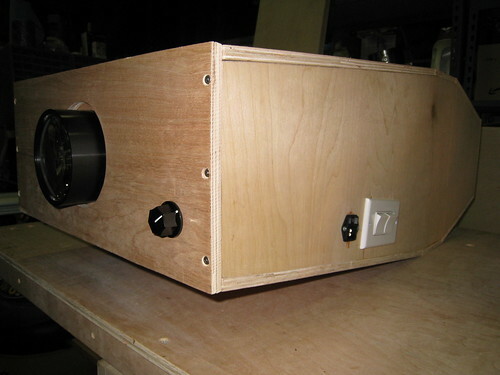 this the 19" 720p lcd projector that i built. it throws a huge clear picture up on the wall. i haven't made any measurements of the displayed image yet but it can fill my 8x10 foot garage door. it is not quite as bright as a store bought projector but with a darkened room, it does just fine. i used a 720p 19" lcd screen sans backlight, a bulb and ballast for huge fishtanks, and a fresnel and triplet lens kit from lumenlab.com. i built it with a focusing sled using a tap and die set to make a threaded hole in polycarbonate kitchen cutting board which, when the focusing knob is turned, moves the lens forward and backward on the sled which is mounted on extension drawer slides. the lighting compartment is encased in reflective tin and there is a focusing lens mounted behind the bulb. two large computer case fans evacuate the heat generated by the bulb. i mounted a dual switch on the side which can turn on and off the fan and bulb separately so the bulb can be cooled for awhile after the light is extinguished.